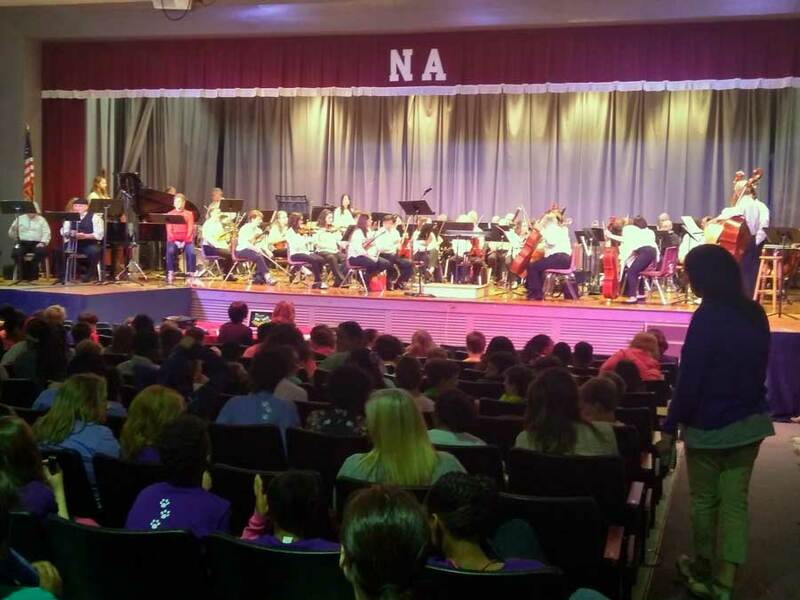 More than seven hundred third, fourth and fifth grade students from New Albany Elementary School played music Friday, April 20, with the North Mississippi Symphony Orchestra. It was the third Carnegie Link-Up program for local students, who were able to participate in the nation-wide music education program sponsored by Carnegie Hall of New York through its Weill Music Institute. The program was first available during the 2015-2016 school year when Celia House, a New Albany native, was hired by the New Albany Public Schools. Educated at Blue Mountain College, House had taught music in the Tupelo Public Schools and worked there with the Link-Up program. Carnegie Hall provides Link Up training materials for elementary school music teachers and coordination with symphony orchestras across the United States and has done so for more than 30 years. Starting early in the school year, House works with her third, fourth, and fifth grade students preparing them to play music in the spring with the North Mississippi Symphony. Students learn to play recorders, a simple woodwind instrument and learn music furnished by the Carnegie Foundation. They then have the opportunity to actually play music with a professional symphony. This year the New Albany students and Tupelo-based symphony played together music by Antonin Dvorak, Duke Ellington, George Gershwin and Leonard Bernstein. The program is sponsored locally by the New Albany Symphony League, which raises money from local contributors to pay the North Mississippi Symphony for the performance with the New Albany Elementary Students. Contributors this year’s third Carnegie Link-Up program included the City of New Albany, BNA Bank, Anne Stephens, UNITE Community Foundation, Nancy Saul, Rheta Ann West, Ethel Holland (in Memory of Bob Holland), Joyce B. Sumners, Mary Jeannette Wynn, Dr. and Mrs. Adam Martin, Jr., Mr. and Mrs. Edgar Capaning, Dr. Collett Cross, Bob and Mary Frances Monroe, Phil and Susan Morris, Baptist Memorial Hospital-Union County, and Julia Parks Barkley. Other contributors were Roy and Melanie Bright, Bobby and Kathy Carter, George and Arhonda Coleman, Bo and Beverly Collins, Jim Owen, Creekmore Clinic, Jean Dillard, Michael Hale, Patty and Ray Collins, Jan Eastman, Ellis Properties LP, Bill and Linda Everett, Mark and Kathy Garrett, Mary Libby Harrison, Don and Dottie Haynie, Historic Northside Garden Club, David and Ann Holmes, Carolyn Houston, Betty DuVall King, Bill Robertson, Mr. and Mrs. Frank Madden, Mr. and Mrs. Denotee Martin, Mr. and Mrs. Allen Maxwell, Dr. and Mrs. Kelton McClinton, Jim and Lisa George, New Albany Kiwanis Club, Pam Brown Insurance, Mary Tate Pannell, Joe Parks, Jr., Gwyn Pennebaker, Pilot Club of New Albany, Grace Provence, Anna Quinn, Republic Finance, Riddle Heating and Air Conditioning, Marshall and Sheila Robbins, Dr. and Mrs. Steve Shirley, and Elizabeth and Dan Skinner. Additional contributors were W. C. Smallwood, Jr., Mr. and Mrs. Mike Staten, The E. J. Stephens Co., Sara Anne Stephens, Mr. and Mrs. John Stroud, Union County Retired Education Personnel, Union Lumber Company, United Funeral Service, Vance and Tootsie Witt, Camille Barkley, Laura Bostwick, Linda and the late Dr. Bruce Bullwinkel, Maxwell and Jolyn Cook, Joe and Jennie Davis, Tammeri Dunnam, Emerald Mississippi, Joy Fisher, Friends of the Jennie Stephens Smith Library, Mr. and Mrs. Jack Herrington, Kappa Kappa Iota, Amy Livingston, Mr. and Mrs. John Moffitt, New Albany Mothers’ Club, Pam Robertson, Jimmie Trussell Rogers, Janis K. Sanders and Stephens Farms, LLC.